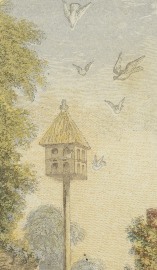 Charming book illustration featuring a very busy bird house. Two stories tall and safely perched on a pole, this is one of the finest examples of bird houses we’ve seen in a while. It would make a great addition to your next creative project.